Less than two years from its debut in the pleasure boating industry, Camuzzi Nautica made clear its intentions: to aim at the top. 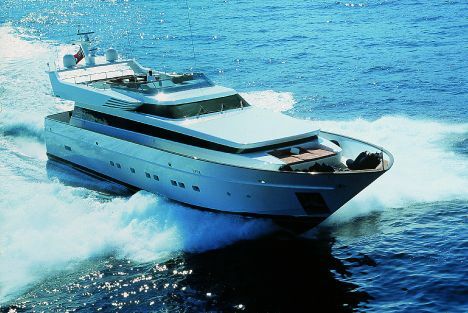 This may be demonstrated by the takeover of the famous shipyards Baglietto and Cantieri di Pisa, two brands that gave prestige to the Italian nautical industry and, because of this, wished for by just about everybody. To reach its goal, the company also employed a managerial staff of demonstrated capacities, in charge of making the yards emerge in the fierce sector of deluxe yachting. The manager who has to carry out the most difficult tasks is Mr. Scaramuccia. As a matter of fact, Mr. Gaspare Borghini, managing director of Camuzzi Nautica and still at the head of Baglietto - the yard he owned and relaunched - seems to be riding the wave of definite success for him and for his boats in virtue of the recently announced data. Mr. Scaramuccia instead, who up until a short time ago was at the head of the Riva yard of the Gruppo Ferretti, is in charge of restoring the original splendor of the Cantieri di Pisa. In the past, this yard lived economical difficulties that many ascribe to the 2003 flop when it put a boat on the competitive market of open motor yachts with the intention of relaunching the yard; nevertheless this choice contributed to its collapse. Less than a year ago, when the yard was in an extremely bad financial and productive situation, Antonio Sostegni sold the shipyard and became a partner of Camuzzi Nautica with a 10% share, just like Borghini. Camuzzi Nautica is controlled by Camuzzi International, a company not only operating in the nautical sector but also in the energy, real estate, publishing fields, etc. In September, we met Luciano Scaramuccia in Monte Carlo, onboard an Akhir - as was to be expected - in order to get to know better his personality, his previous working experiences and the present one. We call him Mr. Relaunch, given his attitude and capacity of putting in order failing productions, as you will learn from the interview. Mr. Scaramuccia answers, smiling, when we ask him to introduce himself, then he adds. Yes, but how did you start? I am an electrical engineer and by chance I came upon shipping. Even though my father was a naval architect, I tried to avoid falling into the trap of the shipping and nautical fields. Yet, I was offered my first job by the Cantieri Navali del Tirreno e Riuniti where the frigates "Lupo" and "Maestrale" were built for the Italian Navy on behalf of Fincantieri. Having a specialization in plant engineering, I was called to destroy and rebuild the shipyard in Riva Trigoso where the above-mentioned frigates were to be built. I spent nine years there, with three different mandates, one more interesting than the next, at the end of which I started studying naval engineering as well, a degree I got at the age of 46. A goal reached not only for obvious reasons linked to my job, but also for passion, because I like to build and create complex things... if I could I would also build bridges, skyscrapers or highways. Yes, also my second job was in a shipping yard, though the vessels were merchant ships such as oil or gas tankers and even this was an extremely interesting experience. The first time I worked on a yacht was in 1982-83 on the 64-meter Creole, the largest sailing boat ever built by the historical English yard Camper & Nicholson. Well, at the time she was not a boat but a wreck; she had been bought by Gucci and had been taken to La Spezia, then a famous demolition center, to see whether after laying her wood bare, her original hull could be partially recovered. We removed 1,000 tons of material from the boat raising her waterline by one meter and a half; then we sandblasted her and I remember that on the first inspection I made aboard with Giorgetti of the Giorgetti&Magrini studio, Gucci's counseling agent, we remained open-mouthed. Inside she was absolutely perfect, the steel structures were intact and the teak was perfect, even better than the one we could possibly find at the time for an eventual replacement. We just had to check whether the brass pins were still in good conditions. To do this we decided to drydock Creole where we checked, reconditioned and replaced 50,000 bronze pins. The job was enormous and tantamount only to the construction of the Pyramids. In order to obtain good results this thorough refitting was made applying the same technology used in the Twenties, when the boat was built. In a way this forced me to retrieve the nautical culture that contemplated the building of beautiful and tough boats, forgotten by my generation; a fascinating experience that triggered in me the desire of repeating it, of making other equally beautiful things. Today, when I see Creole on the horizon, with her 1,400 square meters of sails unfurled to the wind, my heart still beats. Suddenly, since then, all navy ships appeared ugly; I really did not like them any more. Did you give up working with navy or commercial ships since then? Yes, also because soon after Mr. Vitelli who was buying up the shipyard of Fratelli Benetti from bankruptcy called me. He needed a person with given flexibility characteristics, who could relaunch production and who could follow the boat development. Again, this was another beautiful experience, but it was very difficult. I inherited 120 persons in redundancy fund and among the restrictions imposed for the takeover I had to re-employ all of them. The skilled workers were all gone setting up a firm by themselves; the less skilled ones were left behind. Unfortunately, this is the negative side of the bankruptcy of large companies. In practice, we started from below zero: the energy supply had been cut, the licenses were expired, accountancy was non-existent and two or three previous takeovers had sacked the files... it was deadly. I relaunched production and I built a couple of beautiful steel vessels that were launched in 1987 as well as the Atlantic Challenger, in light alloy, the vessel that tried with little luck to set the speed record for the Atlantic crossing. Then, having seen the results I obtained, when Mr. Vitelli had some difficulties in building large fiberglass boats, he put me at the head of the composite mega-yachts department. Considering the way I started, yes, later I did go back to smaller boats, but at that time, I worked on 45-meter yachts. So, you fully participated in the escalation of the maxi-yacht department and with it in the new course taken by the Benetti yard. Absolutely, I collaborated with utmost pleasure with Mr. Vitelli, of whom I have great esteem, as he has for me. Why then your collaboration finished? As I mentioned before, it was a beautiful experience but it became so absorbing that we started becoming tired of each other, we vexed one another almost like husband and wife. At the end, in order to live peacefully, we decided to go each one's own way. Yet, we maintain good relations, almost like friends, I should say. After this experience, he was the one who sometimes gave me advice on the jobs I was offered. I gave his name as reference, because he was well acquainted with me and knew my qualities and my defects. I worked with Fabio Perini. He wanted me to work with him and that is what I did. At the time he was buying up the Picchiotti yard, because besides the main office in La Spezia were the yachts were fitted out, he had only one production yard in Turkey. He sent me to the Picchiotti yard to work with the former director in order to finish the building of mega-yachts over 40 meters long that had not yet been delivered and then to change and adapt the yard to the fitting out of his sailing yachts. The results were such that Mr. Perini decided to close the La Spezia yard and transfer the fitting out of sailing yachts to the Picchiotti yard. Out of curiosity, why good use was not made of the brand name Picchiotti? Actually it is a pity, even if I believe that sooner or later they will use it. When I worked there, from 1990 to 1994, I believed it could be relaunched but I did not succeed in convincing Mr. Perini. At the time, the reason that Fabio gave me was that he was not yet ready for motoryachts. Having nothing to say on this subject, he was not interested in competing on the market just to build a few additional boats. The intellectual honesty of this person is to be held in great esteem: if one does not have a message to convey, it is better not to venture. How did your career continue? After this experience with sailing yachts and motor yachts, I worked as a freelance for four years. I worked twice as a site engineer for 30-40 meter boats for Fipa and San Lorenzo, and then I worked as port authority in Viareggio when the Viareggio Porti S.p.A. was created. At the time I met Leonardo Ferragamo who wanted to take over a yard in Finland. I went there to study the situation and I told him that as for production there were no problems, the takeover could be done. I returned to Finland and stayed there five years and a half. We consolidated the brand name, renewed the range making it one of the most modern ones. I am very fond of this experience for I lived a very nice human relationship but sooner or later I would have to interrupt it. My family was split up in two: my daughter was living with me in Finland and my son - a freshly-graduated engineer - was keeping company to his mother, the situation was unbearable. I lived another beautiful period because Riva is a fantastic brand; it has a marvelous range of products. Yet, again, I found myself traveling around the world, going from one meeting to the next, visiting boat shows, studying at the university, etc. ; I hardly stayed at home. So, the ideal solution for a person like me who originates from Viareggio, was to work for Cantieri di Pisa. I met the entrepreneurs of the Gruppo Camuzzi, who have great ideas, excellent development and consolidation plans of the two very famous brands Baglietto and Cantieri di Pisa and I could hardly believe I would collaborate with them, offering my contribution. Which are your impressions in this new reality? I think the persons in charge of the Group have very clear ideas, for they brought respite to the brands that are potentially capable of emerging and added their entrepreneurial flair for correct investments, in terms of human resources, structures and new models. They know they have the possibility of transforming small firms into prominent yards on the international level. Most probably, the misfortune was due to the little experience on the international level of the former managers. The motoryacht business is very fascinating and it certainly attracts financial pools, banks, and so on; if this fascination is not translated into good use of adequately prepared resources then it is chaos. This idea was not clear in the minds of the different owners who successively owned the yard. They only concentrated on the business aspect, without considering other fundamental ones. For a business activity to succeed, one must go through consolidation of management control, costs control, schedule control, quality control, a wide-ranging, long-term industrial plan that is coordinated and strategical. There are too many fake business plans: I have a large collection of them at home: they may be used to collect large amounts of money but then you do not know how to use them and which are their goals. Woe betide those who are fascinated by this world but do not go deeply into the questions and are not able to read between the lines. Cantieri di Pisa was one of those cases behind which there was a fascinating business plan that was not supported by facts. All in all, if the necessary steps were taken the business plan could still be valid, otherwise it would be useless, it would be like building a beautiful skyscraper starting from the roof. In Cantieri di Pisa we found fantastic workers who have been building these splendid motoryachts but we also found old infrastructures that were not adequate to the type of product we wanted to build and above all management and production quality control were non-existent. As for Kaitos, the former managers simply mistook the sequence of actions. The design is incredibly valid, because this hull - I went onboard the prototype - offers exceptional performances, that nowadays, two years later, no other yard may boast. On the commercial level they did not succeed in instilling the emotions they had created and announced with pomp and circumstances, moreover they presented the yacht before having completely refined her; this is what originated the flop. Will Cantieri di Pisa maintain its identity as a yard that builds boats for few clients or will its production increase considerably? The industrial product is not part of the values of Cantieri di Pisa. The Group's board wants to maintain a top-quality production. Akhirs will always be refined motoryachts for Owners desiring luxury, comfort, no vibrations and quality woods, for Owners who like to look around them and take pleasure in their yacht. Akhirs were famous even when I was working for San Lorenzo, Azimut, Benetti because the greatest admirers were the employers of the Classification Registers. I got to know the quality of the Akhirs through the promotion made by ABS, the American Bureau of Shipping, and the Lloyd's Register, which are notoriously rigorous registers. So you succeed in satisfying not only the clients who looks at the aesthetics but also those who are actually able to appreciate a vessel considering the quality of the hull, the plants, etc. Absolutely, our quality is perceptible in every detail of the hull. Many people who visited our boats at boat shows at the beginning of the season, who had not seen Akhirs in a long time or who did not know them at all, were astonished by their quality. Even though the boat they were visiting was 3-4 years old, her quality was still perfectly tangible. This was essential. The best way to go is to have no need of short-term results. You should not work just aiming at the profits otherwise you would end up making the wrong decisions; this is what contributed to the bankruptcy of the Cantieri di Pisa, the owners needed immediate results to show their investors. Nowadays many people want to invest in the nautical field, how do you explain this? At the moment everybody wants to become the owner of a shipping yard because it is a fantastic shortcut to appear on the press and because everyone hypothesizes that in the nautical field you can make big money. Of course you can make big money but you need to plan correctly and follow the right steps. How will the yard's production evolve in the next two years? Our first step was to increase production from one, one boat and a half to four per season. At the moment we are building a 26, a 31, a 38 and a 43 meter, that is, beautiful and important yachts. In a couple of years, if we improve, we will be able to build five boats and, at the same time, we will offer new models such as a 34 meter and maybe even something smaller. Our production will always be in fiberglass. We have an enormous potential; we just need to use at best the qualities of Cantieri di Pisa's main resources - the ability of its unskilled and skilled workers and of its board - and of applying it to several units to increase the efficiency of the yard. Then, investments will be used to improve the infrastructures, the launching systems, the boat moving systems; we will apply scale economies to obtain better results, hoping where possible to reduce prices or further increase quality. Are you planning to modify in any way the existing range? We will evolve knowing exactly what we want to do. We will not revolutionize anything, we will refine production, modify the styling of older models little by little and then we will try to optimize the technical part with the cultural background that is the added value of all the Cantieri di Pisa employers. That is why we will not revolutionize anything. In view of this slow but constant productivity growth, is a structural increase planned? Let us say that, luckily, this could be possible. Our main office is situated in a beautiful location, well connected to the highway and to Pisa Airport; because of this we are aiming at expanding our activity in the channel Canale dei Navicelli along which our yard stands. Reconditioning of the channel is being considered in order to make it navigable to the Arno River and the sea, and theoretically, to allow smaller boats to sail up to Florence as it occurred in pre-war times, before being interrupted by the bombings. This fantastic project may serve as a launching pad for developing the area.